Most if not all manufacturing operations that deal with bulk materials will agree that downtime and loss of production are at the top of their list of process concerns. Downtime in a bulk material handling operation can usually be traced to the equipment that moves the material throughout the process. Flexible screw conveyors are among the most common pieces of equipment found in these operations and have been used in dry processing applications for decades. 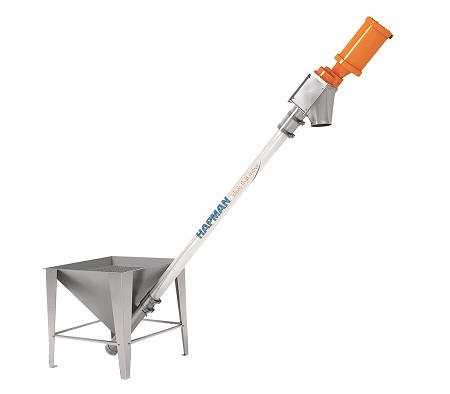 They are a reliable, simple, and low-maintenance bulk material handling solution that uses a single moving part to effectively convey dry material from one point to another. With flexible screw conveyors, failures almost always occur during the initial start-up of the equipment. This is a clear indication that the conveyor manufacturer did not specify the conveyor correctly or outfit it with the correct options to ensure proper operation within the application. Material flow. The conveyor will not be able to move or elevate the material properly through the process, eject the material out of the discharge end of the conveyor, or move the material to the next stage of the process after filling the hopper. In any of these scenarios, the conveyor will not be able to keep up with downstream processes. Screw breakage. An inferior-duty screw will break shortly after start-up. Similar-duty replacement screws will continue to break due to incorrect specification. Even when dealing with a responsive equipment provider, it can be time-consuming for a 20-ft replacement screw to arrive via truck or common carrier, which adds to the length of production loss and downtime. An experienced flexible screw conveyor provider will ask the right questions to extract the necessary information from a customer, starting with material flow. Problems related to material flow generally boil down to the type of product being conveyed. If the correct screw type isn’t applied at the outset based on the specific material the conveyor will be required to handle, all of the material flow issues mentioned earlier will arise and compromise production. As part of the specification process, an experienced conveyor manufacturer will perform a material flow analysis—which is the best way to determine effective flow from the hopper through the conveyor—as well as measure the bulk density and ask about convey rates. 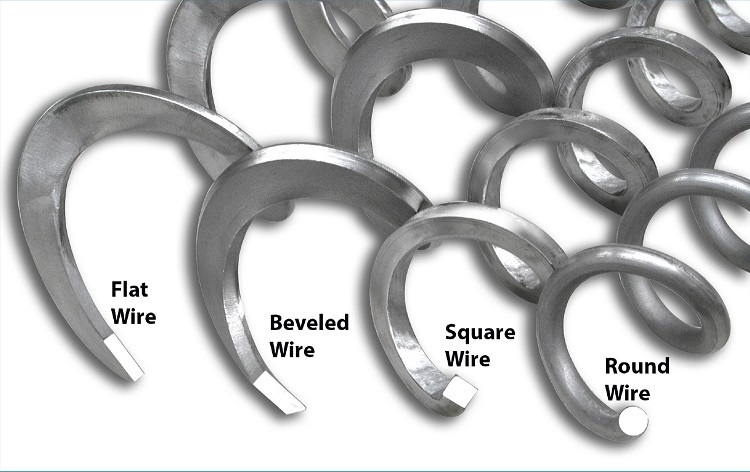 Once the exact product is determined and a flow analysis is completed, an experienced equipment provider will then identify the type of screw that will be most effective in the conveyor (flat wire, round wire, beveled, and heavy-duty square bar). One universal design consideration with flexible screw conveyors is the pickup angle, the angle from horizontal at which the conveyor body operates. 45 degrees is a common pickup angle that strikes a good balance between operating efficiency and space requirements. Above 45 degrees, operating efficiency goes down. It’s generally not recommended to run very heavy materials at angles greater than 45 degrees. Conversely, angles shallower than 45 degrees allow higher efficiency and increased convey rates. However, pickup angle is about more than just simple operating efficiency. It’s also about how efficiently the auger inlet is filled with material. This “fill factor” has a direct impact on convey rates or whether the conveyor will work at all. The steeper the pickup angle, the lower the fill factor and convey rate. Shallower angles yield higher fill factors, but very high factors approaching 100% can lead to jams. In these cases, alternate screw designs can be employed. Flanged small-inlet feeders are sometimes used in place of a hopper to supply the screw conveyor. Depending on the material being conveyed, this practice can lead to trouble. Flexible screw conveyors require material headload on the auger for good elevation. Light or easily-fluidized materials may not be able to deliver enough headload in flanged inlet systems, and consequently run poorly in the auger, especially at steeper pickup angles. For these materials, full-sized hoppers are a better bet. By design, they provide more headload and offer enough space to include agitators that assure consistent auger loading. The physical properties of some bulk materials can cause problems in flexible screw conveying. Fortunately, there are workarounds for many of them. Use a center core for heavy or fluidizable materials. Under mechanical agitation, materials like talc, dry dusty flours, or starches tend to fluidize and cause fallback in standard open screw designs, especially with relatively low auger walls. Adding a center core reduces the amount of material being conveyed, provides better material containment, and reduces the load imposed on the screw, which can dramatically improve elevation performance. Prevent zinc oxide buildup. Widely used in many industries, zinc oxide is extremely sensitive to buildup on machinery, including conveyors with flat screw designs. Beveled screws are a better choice for zinc oxide; they have a trailing edge scraper that removes buildup and maintains a free-working casing. Stay on the straight and narrow with abrasive materials. Heavy abrasive materials like salt or sand are likely to cause extra wear and tear at bends or flexes in conveyor runs. When confined in small spaces, these types of particles can interlock and exacerbate wear problems. When handling abrasive materials, it’s best to plan straight conveyor runs to head off trouble. Use agitation to manage materials that pack or agglomerate. Some materials require mechanical agitation to flow properly in hoppers or other auger loading spaces. Any material that can be compacted into a “snowball” is likely to require agitation. Materials that contain oils, such as pancake mixes, nacho seasonings, or cheddar seasonings, are often troublesome. Materials with “oxide” in their names, like iron oxide or titanium dioxide, tend to flow sluggishly. Calcium carbonate is another very common material with flow issues. Hoppers with pin or ribbon-style agitators or vibratory systems prevent these sorts of materials from ratholing or bridging at auger inlets. Many agitators are available with easily-interchangeable pins or ribbons to achieve ideal flow performance for a given material. And, there are many options for retrofitting existing hoppers with agitators. 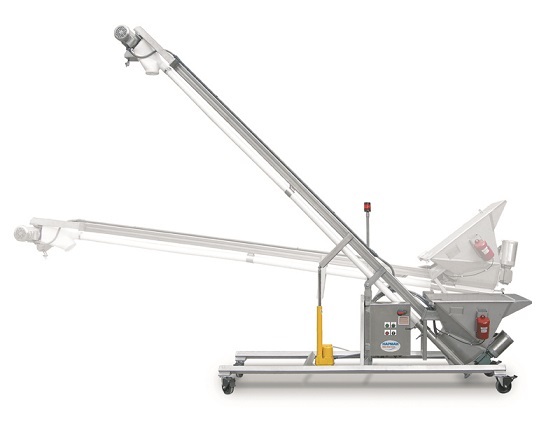 While a complete ribbon-agitated hopper might cost approximately $6000, retrofit agitators can be added to an existing hopper for about $2000 – money well spent to keep an operation running smoothly. 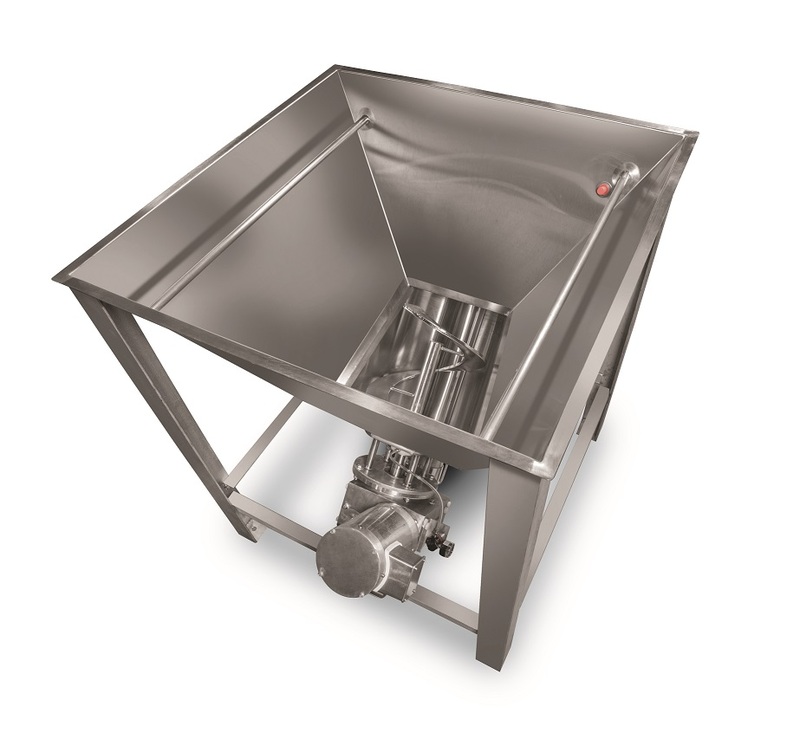 By their nature, bulk solids and powders will inevitably leave some residue in conveyors. To help manufacturers maintain maximum process uptime, flexible screw conveyors should be designed with features that allow fast, easy disassembly, cleanout, and reassembly between production runs. As an example, Hapman’s Hi/Lo design allows for easy screw removal, cleanout, and/or changeout from floor level. Internal spaces should be free of crevices or other spaces that might trap particles or slow cleaning operations. This is particularly important when handling materials like potential food allergens or contamination-sensitive chemicals. The number of custom options a conveyor manufacturer offers is directly proportional to its level of expertise. The longer an equipment provider has been in business, the more solutions it offers due to a history of working with many customers and applications. For example, not all manufacturers offer heavier-duty screws or nominal case diameters in odd sizes such as 2, 2½, 3, and 5 inches. Also, while many manufacturers advertise expedited delivery times, they aren’t specific about the timeframe or don’t apply the policy to custom sizes or engineered equipment. Knowing up-front that a conveyor will be delivered in the exact size and by the exact date needed is crucial to minimizing unexpected downtime. To minimize downtime in material handling, a company should focus on specifying the right equipment with the help of an expert material handling equipment partner. An experienced conveyor manufacturer will understand the importance of proper operation at initial start-up and will ask all the right questions up-front to achieve that goal. It is imperative that the customer be forthcoming will all the pertinent information as well, but just as there are no shortcuts to equipment selection, there is no substitute for industry expertise when it comes to being confident about arriving at an ideal bulk material conveying solution. Mike Zeluff is product specialist at Hapman (Kalamazoo, MI), where he has worked for more than 22 years. For 70 years, Hapman has provided manufacturing plants worldwide with technologically advanced powder and bulk handling equipment and systems, offering custom engineered equipment and systems for chemical, food, pharmaceutical, plastics, building, minerals, and other industries. For more information, visit hapman.com.